KENNEDY SPACE CENTER, FL--In what proponents hail as the dawn of a new era, Space Exploration Technologies Corp. is in the final stages of prepping a low-cost Falcon 9 rocket for launch Saturday on a long-awaited mission to boost the company's unmanned Dragon cargo ship on an inaugural flight to the International Space Station. The solar-powered capsule is the first of a new breed of private-sector spacecraft built for NASA in a commercial venture to deliver critical supplies to the space station in the wake of the shuttle's retirement and, if the company's founder has his way, to eventually carry astronauts to and from the lab complex. "I think we are at a major inflection point in space," Elon Musk, the internet entrepreneur who founded SpaceX and serves as its chief designer, told "60 Minutes." "I think we're at the dawn of a new era, and I think it's going to be very exciting to people in America and around the world." With a rock star persona, deep pockets and a relentless drive to lower costs and change the way the space industry operates, Musk hopes to beat out Boeing and other aerospace competitors by selling NASA on a manned version of the Dragon cargo ship to ferry astronauts to and from the station. Beyond that he envisions building fully reusable rockets for eventual flights to Mars with a long-range goal of reducing the cost of spaceflight to the point that it becomes widely affordable. "I'm hopeful that in 20 years we'll be taking lots of people and equipment to Mars and that the beginnings of a self-sustaining base on Mars will be there. I'm not saying this will happen. You asked what I hope will happen, so I hope that will happen. Yeah, I think it's possible." But even Musk knows SpaceX must learn to walk before it can run and a major step on the road to credibility will be Saturday's planned launch of the Falcon 9/Dragon spacecraft. Criticized at times for what some perceive as over confidence or even arrogance, Musk has gone out of his way to lower expectations for this first space station test flight. "This is pretty tricky," he said in a pre-flight news conference. "The public out there, they may not realize the space station is zooming around the Earth every 90 minutes and it's going 17,000 miles an hour. So you've got to launch up there, you've got to rendezvous and be tracking space station to within inches, really, and this is a thing that's going 12 times faster than the bullet from an assault rifle. "So it's hard. I think we've got a pretty good chance, but I want to emphasize this, this is a test flight. If we don't succeed in berthing on this mission then we've got a couple of more missions later this year and I think we'll succeed on one of those." The goal of the mission, repeatedly delayed to allow more time for software tests and checkout, is to rendezvous with the International Space Station and in so doing, demonstrate the Dragon capsule's ability to autonomously fly a precise trajectory, respond to commands and to safely abort an approach if something goes wrong. If the flight goes well, SpaceX will be clear to press ahead with routine cargo delivery missions later this year under a $1.6 billion NASA contract calling for at least 12 flights to the space station at an average cost of some $133 million per mission -- a bargain in the high-cost world of space operations. If there are any major problems, that schedule likely would be disrupted. But NASA's final shuttle flight to the station last summer left the outpost well stocked and NASA managers say there's plenty of time to recover from a mishap or software problems that might prevent a linkup. "I think this is an interesting test flight, I think it's ambitious, I think if they get up there and they fly safely around the station that's a great success," said Scott Pace, director of the Space Policy Institute at George Washington University. "I think it'll be really, really impressive if they, in fact, can berth. I think that's a stretch, but if that's done then I would be very technically impressed." Pulling off an orbital rendezvous is a feat only a handful of nations and major aerospace contractors have achieved and despite Musk's efforts to downplay the significance of the Falcon 9/Dragon mission, many view the flight as a watershed moment for NASA and the Obama administration's push to commercialize space. "Saturday is a huge day for NASA and the nation," NASA Administrator Charles Bolden told CBS News. "It will mark the return of cargo launches to American soil. We've been reliant on our international partners since we phased the space shuttle out, but this will be bringing it back home -- American jobs, launches from Cape Canaveral, and that's critical." That level of attention focused an unmanned test flight by a company with a comparatively short track record rankles critics and competitors alike. United Launch Alliance, which builds Delta 4 and Atlas 5 boosters for NASA and the military, does not get nearly this level of public scrutiny even though the company routinely -- and successfully -- launches some of the world's most sophisticated satellites and space probes. The latest versions of the workhorse Atlas and Delta rockets have perfect flight records and ULA plans to "man rate" the Atlas 5 for use by SpaceX's competitors bidding for separate NASA contracts to build a commercial manned spacecraft to ferry astronauts to and from the space station. But SpaceX engineers believe they have a leg up on the competition, gaining valuable flight experience with the unmanned Falcon 9/Dragon cargo missions, knowledge that will be plowed directly into the manned version of the spacecraft. And so, in the wake of the shuttle's retirement and the Obama administration's directive for NASA to "buy" rockets for flights to low-Earth orbit, SpaceX, with its relatively low-cost boosters, has emerged as a major player in the space agency's near-term future. "I would argue part of the attention (SpaceX is) getting is very natural just given the end of the shuttle," said Pace. "But there maybe is extra attention to it because there's a realization there really is nothing else, that either the private sector approach that the administration has put front and center works or it doesn't. And so the stakes are higher. It's a riskier approach, and therefore people pay more attention to it." Some commercial space proponents view the SpaceX launch as "validating a narrative about the private sector, which I think is overblown," Pace said. "This is an innovative effort, I'm glad that NASA initiated it ... but it's taken on some extra attention precisely because of the feeling that the stakes have been made higher for it and, I argue, unnecessarily higher." Unnecessary or not, the stakes are, in fact, high. And a major question mark is how reliable the SpaceX rockets and capsules will prove to be and whether Musk can routinely deliver Falcon 9 boosters for the bargain-basement prices he advertises on the web -- $54 million. It is difficult to compare that to the cost of an Atlas or Delta because the ULA rockets are built under a different type of contract and the boosters vary widely depending on customer requirements. But the low end of the cost spectrum is believed to be around $100 million. While the idiom "you get what you pay for" might occur to some observers, Mike Horkachuck, the NASA project executive for SpaceX, insists any concern along those lines is misplaced. "When you hear 'cheaper' you sometimes think it's going to be less reliable," he said. "I know for a fact that SpaceX is very focused on trying to make sure that their systems work. They know that as a company they have to make their products successful or they're not going to get new business. So they're very focused on making sure that their systems will work and that they have high reliability built into the systems. "They may go about doing it a little bit different than we have in the past, but it's always in the back of their minds that they have to make these vehicles work or they're not going to have a long-term viable company. In some cases, it's even more important to them that it's all successful than other companies." 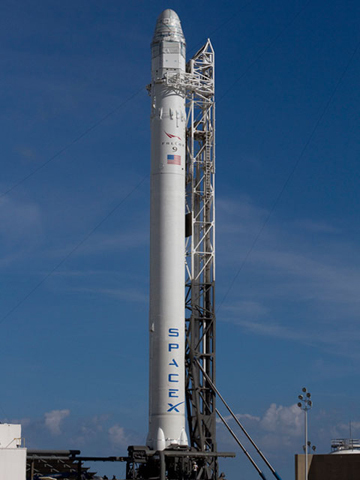 Making only its third flight, the 157-foot-tall two-stage Falcon 9 rocket is scheduled to blast off Saturday from complex 40 at the Cape Canaveral Air Force Station at 4:55:18 a.m. EDT (GMT-4), roughly the moment Earth's rotation carries the pad into the plane of the space station's orbit. Forecasters are predicting a 70 percent chance of good weather. Unlike the more-powerful but now-retired space shuttle, which had enough thrust to launch five minutes to either side of that "in-plane" moment and still steer into the proper orbital plane, the 690,000-pound Falcon 9 must take off on time to the second to catch up with the space station. If the countdown is interrupted for any reason, the flight will be delayed to May 22. But if all goes well, the Falcon's nine first-stage Merlin engines, generating 1.1 million pounds of thrust, will burn for three minutes, pushing the spacecraft out of the dense lower atmosphere. The second stage, powered by a single Merlin engine burning kerosene and liquid oxygen, will finish the climb to orbit nine minutes and 14 seconds after liftoff. Thirty-five seconds later, the Dragon capsule will be released from the second stage and a few moments after that, its two solar panels should unfold to begin generating power and recharging on-board batteries. That will set the stage for a complex series of tests to check out the spacecraft's complex flight software, its navigation system and sensors, its 18 Draco thrusters and communications systems. "Dragon is autonomous, it's a robotic spaceship and it's going to go and do this complicated maneuver where it's going to work with the space station," Musk said. "It's not as though there were somebody flying it with a joystick or there is somebody on board who can make realtime corrections. Dragon is making lots of decisions all the time to optimize the probability of success. There's a lot of intelligence on board the spacecraft." 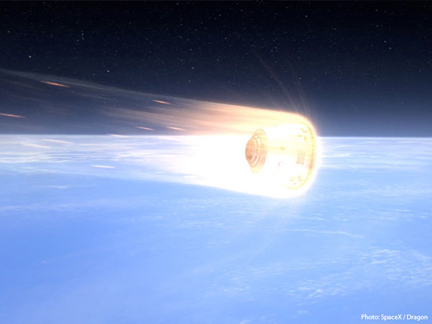 But this will be just the second flight of a Dragon capsule following a successful test flight in December 2010. And it will be the first featuring solar panels and the first to fly all the way to the International Space Station. SpaceX flight controllers will be responsible for the mission from launch through arrival near the space station. From there, NASA will have the final say. The Dragon will not be allowed to begin its final approach to the station until the NASA flight control team is convinced the spacecraft is operating properly. "Our role here in Houston is really the safety of the crew on board the space station, the space station itself and then the SpaceX/Dragon team is responsible for mission success," said space station Flight Director Holly Ridings. "And we've built a framework working together where we should be able to get both of those items successfully accomplished." Starting from a point 6.2 miles below and well behind the laboratory, Dragon's suite of flight computers will use data from navigation satellites and the space station to precisely compute its position, using those data to maneuver itself to a point just 1.6 miles below the complex. 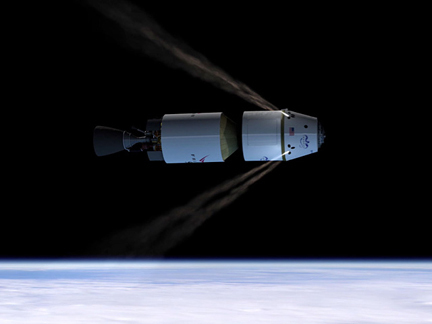 A variety of tests will be performed before the Dragon drops back down to a point 6.2 miles below the station. Over the next day, the capsule will pull out in front of the station, loop up and over it and eventually return to a point 6.2 miles below and behind the laboratory. "That fly under is very important to us because it's the first time the Dragon and the space station will communicate with each other, an absolute requirement for proximity operations," Ridings said. "It's the first time the crew on board the ISS will send commands to Dragon and get a response. The flight control team also will be testing the spacecraft's navigation system to make sure the flight computers are able to accurately calculate the ship's position in space relative to the space station. "The way the two vehicles navigate together is relative, where you get pieces of information from both vehicles and you do the calculation and then they know exactly where they are in space relative to each other," Ridings said. "And so we're gathering information to make sure that navigation system works." If all of that goes well, the Dragon spacecraft will be cleared to move in for berthing on May 22, flying a stepwise automated approach to hold points 1.5 miles and .9 miles directly below the station. Assuming all systems are operating normally, the capsule will move up to a point just 820 feet below the station for another series of controllability tests. Only then will Dragon be cleared to approach to within about 30 feet. "The Dragon will approach from 250 (meters; 820 feet), so it starts moving toward the space station," Ridings said. 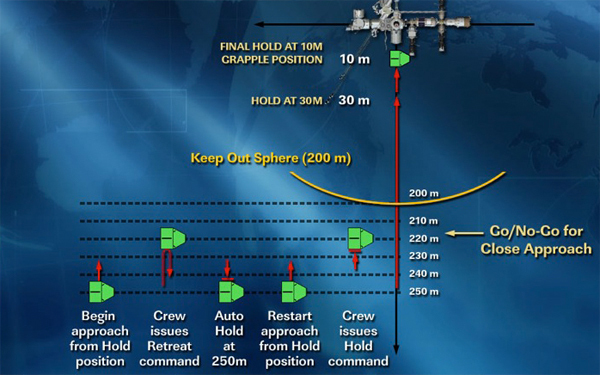 "The crew will then command a retreat and so it will turn and head back to that 250-meter hold point. ... Then the dragon team at Hawthorne will send the Dragon again towards the space station. The crew will tell the Dragon to hold, that'll be at about 220 meters. That will be the last of our go-no go objectives in terms of the demonstration objectives." At that point, "we take a poll and make sure that all of the systems on board the ISS, all the systems on board the Dragon, any type of failure detection, the robotic arm, the cameras, basically everything you need in order to do that next step of the mission is in the configuration you expected. And then after you've had that communication between the two teams and everything is in the proper configuration, then the go is allowing the Dragon to proceed and continue with the next step of the mission." Once at the capture point 30 feet from the station, rocket thrusters will be disabled and the lab's Canadian-built robot arm, operated by flight engineer Donald Pettit, will latch on. Pettit then will trade places with European Space Agency astronaut Andre Kuipers, who will use the arm to maneuver Dragon into position for berthing at the forward Harmony module's Earth-facing port. Pettit will make sure the common berthing mechanism operates as required to firmly lock Dragon to the space station. "We've been doing quite a bit of training, particularly oriented towards the crew role, which is flying the robotic arm and capturing the SpaceX vehicle when it gets in a holding pattern near space station," said Pettit. "And then the arm will maneuver the Dragon vehicle to one of our docking ports and then we'll fasten it to station and then we can go about ... opening the hatch. "That whole process is going to be a long day for us, it's going to be 10 hours-plus to get all of that done. If we have a few hitches, we may have to put things on hold and pick it up the next day." For its initial visit, the Dragon capsule will be carrying nearly 1,150 pounds of cargo: 674 pounds of food and crew provisions; 46 pounds of science hardware and equipment; 271 pounds of cargo bags needed for future flights; and 22 pounds of computer equipment. 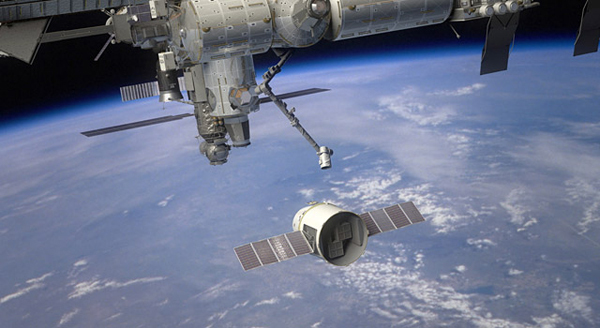 NASA originally planned for the Dragon to remain docked with the station for about three weeks. 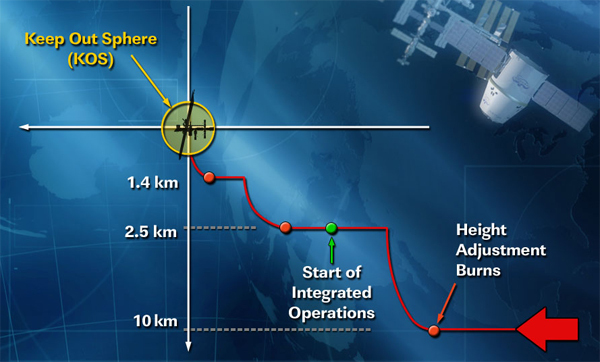 But in early June, the angle between the sun and the plane of the station's orbit will begin resulting in temperatures that will require flight controllers to either bring the capsule home early or keep it at the station for an extended period. As it now stands, Dragon will remained docked until May 31. At that point, the station's robot arm will unberth the capsule and then release it. Unlike all other Russian, European and Japanese cargo ships servicing the International Space Station, the Dragon is equipped with a heat shield and parachutes for an ocean splashdown off the coast of California. The spacecraft is capable of carrying more than 5,500 pounds of cargo back to Earth, a critical consideration when it comes to getting biological samples and failed components back to scientists and engineers on the ground. For the initial test flight, NASA only plans to bring back about 1,455 pounds of equipment and no-longer-needed material. "This is an important mission, but it is still a test flight," Horkachuck said. "There are a lot of things that could go wrong. We've done a lot of work on the ground and a lot of testing to try to make sure things work, but invariably once you get into space something doesn't work the way you necessarily thought it was going to work. So we'll look at the data and see how the mission went and then decide if we need another test flight or if we an move on to the operations phase." The commercial cargo contracts grew out of a 2004 decision by the Bush administration to complete the space station, retire the space shuttle and to use the money saved to develop new rockets and spacecraft for flights back to the moon in the early 2020s. The Obama administration later canceled the moon program but left the shuttle retirement in place and along with it, a NASA initiative to encourage development of private sector rockets to deliver cargo to the International Space Station. Two contracts ultimately were awarded by the Commercial Orbital Transportation Services program (COTS), one to SpaceX of Hawthorne, Calif., and the other to Orbital Sciences of Dulles, Va.
"When the decision was made to retire the shuttle and continue our exploration program, we very much would have liked to purchase commercial services to resupply the space station," said Alan Lindenmoyer, manager of NASA's commercial crew and cargo program. "But those capabilities just simply didn't exist in the U.S. market. "So we decided to think like an investor, we wanted to become a consumer of services rather than a customer with requirements. That would be our more traditional approach -- write requirements, go hire a prime contractor and develop the capability. But we believed that these capabilities were within the grasp of U.S. commercial industry." The program got underway five years ago. "We had to learn how to think like an investor, we wanted to place strategic financial investments to help stimulate the commercial space industry," Lindenmoyer said. "Then we put some structure around those investments where we developed the program to have the companies demonstrate these capabilities with the goal of achieving safe, reliable and cost-effective services. We were looking to help lower the cost of access to space. We believed that would, of course, help us out and also be the key to opening up new markets in low-Earth orbit." When all was said and done, Orbital Sciences won a contract valued at $1.9 billion for eight cargo flights to the station. Another $288 million was budgeted for development and at least one test flight. 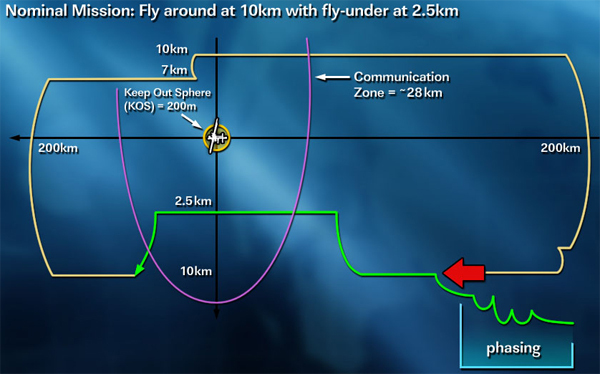 An initial demonstration mission is planned later this year. SpaceX holds a $1.6 billion contract to provide 12 cargo flights to the station for delivery of more than 44,000 pounds of equipment and supplies. The company initially planned three test flights under a separate contract valued at up to $396 million. 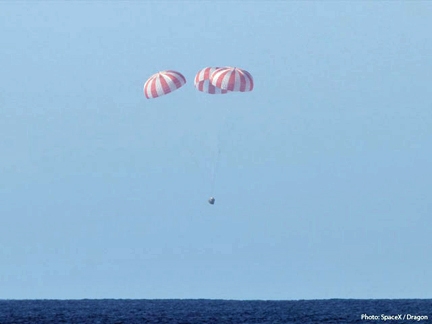 The first flight was successfully carried out in December 2010 when a Dragon capsule was lofted into orbit and guided to a successful splashdown in the Pacific Ocean, the first commercial spacecraft ever recovered from orbit. As originally envisioned, the second test flight would have tested rendezvous procedures and included a close-approach to the station with berthing deferred to the third flight. But SpaceX successfully lobbied NASA to combine the second and third test flights into a single mission and that is the flight scheduled for launch Saturday. 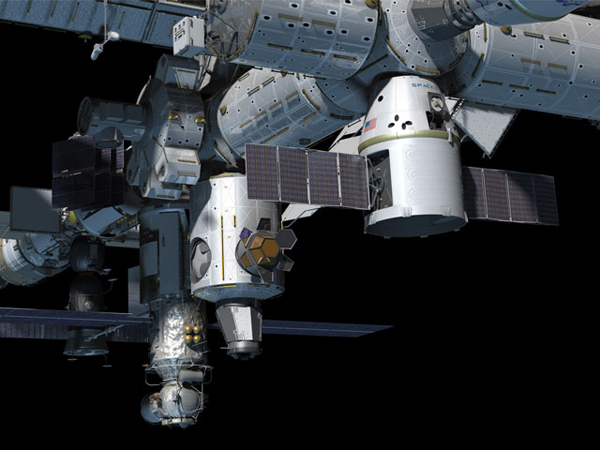 The Obama administration's push to develop a commercial manned spacecraft to ferry astronauts to and from the space station is a separate effort. A half-dozen companies, including SpaceX, currently are competing for NASA contracts to refine their designs. It's not yet clear whether NASA's budget will support more than one provider, but no one is expected to fly before 2017.